Queen Margrethe of Denmark has spoken out against radical Islam and called on Muslim immigrants in the country to improve their Danish language skills. The queen, quoted in a new authorised biography, said people had to take the "challenge" of Islam seriously. "We have let this issue float around for too long, because we are tolerant and rather lazy," she said. The queen said Muslims should learn Danish properly, so they would not feel excluded from society. In the book Margrethe, written by journalist Annelise Bistrup, the queen is quoted as voicing disapproval of "these people for whom religion is their entire life". Calling for opposition to radical Islam, she said: "We have to run the risk of being labelled in an unflattering way, because there are some things for which we should display no tolerance." More than 400,000 of Denmark's 5.4 million inhabitants are immigrants, but only about 150,000 are Muslims, amounting to 3% of the population. However, that still makes them the second-largest religious group in Denmark behind the Lutheran-Evangelical Church, of which the queen is supreme governor and to which 85% of the population belong. The government has implemented a series of measures in recent years aimed at curbing immigration, which include making it harder for people to bring in foreign spouses or gain asylum in Denmark. 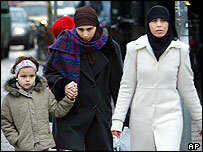 As in France, the issue of Islamic headgear for women has caused controversy. In January, Denmark's Supreme Court ruled that a supermarket chain had the right to fire a young Muslim woman for wearing an Islamic headscarf to work.